Please note: There will be emergency tree felling works carried out at Carnethic from April 29th which are expected to take 4-5 days (weather permitting). As the trees are situated at the entrance of the drive, there will be no vehicle access in/out of the car park between 9am and 5pm. There is parking available across the road in the residential Hill Hay estate. Poolside is a pretty apartment set in large, award-winning gardens, with full use of Carnethic House's facilities including indoor/outdoor heated swimming pool, sauna and changing room with shower. Sunloungers and a number of outside seating and dining areas are also available. All amenities are within very easy access. The apartment has a living-dining room that opens out onto a south-facing private patio with outside dining furniture and a sun umbrella. Poolside also benefits from off-road allocated parking and is a 15-minute walk into the centre of the beautiful historic port of Fowey where you will find an array of shops, bars and restaurants along with stunning scenery. The local town bus provides an easy return journey. The closest beach to the apartment is Readymoney Cove, a 15-minute stroll from the end of the gardens, via a picturesque wooded footpath. Other footpaths, beaches, the South West Coastal path and the All Saints Way can also be accessed through the gardens. Some local beaches have dog restrictions during the summer months, but the wide sands of Par beach, a short drive away, are available all year round. The world renowned Eden project is a 20-minute drive away. Other tourist sites in Cornwall are easily accessible. The apartment is quiet and well away from any road noise with parking right outside the accommodation. It provides a perfect, cosy hideaway from the hustle and bustle of the town centre with narrow streets and limited parking. It is ideal for couples wishing to walk, enjoy the sea and it's environment, explore local tourist attractions and visit the town for shopping and eating experiences. The town has a number of independent fashion and gift shops, traditional butchers and bakers, bookshops, a grocery store, branches of chains such as Seasalt, White Stuff, Moshulu, Crew Clothing and Joules and provides a wide shopping experience. The renowned Jo Downs gallery has glass from her Launceston studio. There are a few pieces in the apartment too! Many shops accept dogs on leads, so they needn't curtail your shopping! Larger shops and facilities, a Foodhall and Garden Centre for example, are available at Par, and major supermarkets are available in St Austell. The Fowey Festival of Arts and Literature, 11-18 May 2019, which was inspired by the famous local author, Daphne du Maurier, offers a range of events in a number of venues around the town. The Fowey Regatta, 18-24 August 2019, offers an array of sailing and other activities in and around the harbour, including a stunning fireworks display. Poolside has lovely gardens, a fantastic pool complex, heated throughout the year, and is walking distance to the beach and the town centre. There's a very convenient town bus and easy on-site parking. The apartment itself is smart, and perfect for two people. Fowey is a fabulous destination for walkers, foodies, shoppers and anyone interested in water activities and is ideal for visiting other key venues in Cornwall, for example, the Eden Project, Lost Gardens of Heligan and Charlestown. Fowey offers a range of activities and events throughout the year not just during the summer season. During the year, there are various events such as the week-long Fowey festival, which followed from the Daphne du Maurier festival. For sailing enthusiasts, the town regatta is held during August. Open plan living area with kitchen, lounge and table for two. Kingsize bedroom with ensuite shower. Indoor, heated, swimming pool - roof and side of the building can be retracted in good weather. 1 dedicated parking space plus use of additional, unmarked spaces. May not be suited for those with limited mobility. Prices from £400 - £737 (Weekly). There is free and private parking for Poolside at Carnethic. Really good apartment next to a great pool. Would definitely make a return visit. A lovely, well appointed cosy apartment. Patio and furniture, French doors open onto patio from lounge/dining area. Very well kept gardens, indoor/outdoor pool right next door. We stayed a week in June and it was lovely weather, warm enough to have breakfast and dinner outside - and nice and quiet. The kitchen area had everything we (read I) needed to cook, and I even managed the combi microwave. We had a minor hot water problem but this was soon resolved by Fowey Homes. The welcoming bubbles was lovely. We hope to return. The apartment was located within walking distance from the town, with a great dog walk on route. Lovely garden and nice to have an indoor pool next door. Catered perfectly for us and our dog. Weather was poor but location and nearby sights were nice. Food in the area was all good! A great place to stay all you could ask for. We had a very enjoyable stay at Abi's place. 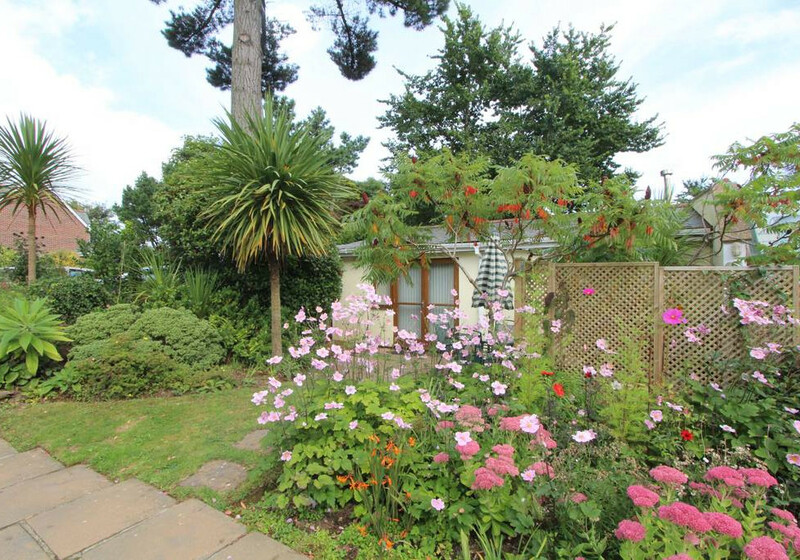 The apartment is ideal for a couple overlooking lovely gardens. The apartment was full of the afternoon sunshine when we arrived. The pool and sauna next door were an added bonus (we did not notice any noise overnight). It was well equipped and very comfortable. It is an ideal location for the area, but its a good walk down into Fowey (which we didn't mind). But there is a shuttle bus from the main car parks. Recommended! We really enjoyed our stay in the pool house. Close to some lovely walks (to secluded beaches!) And a 10 min walk to the village. Accommodation was clean, spacious, very quite and private. The gardens are beautifully kept and the indoor pool was a great bonus. Lovely location easy to find. We enjoyed our stay in this property set in beautiful gardens. The apartment has everything you need to enjoy the joys of Cornwall. Very quiet setting. No noise or disturbance from the next door pool, which was very nice and clean. A very nice apartment and location. We hope to return soon. Excellent location, 20 min walk to Fowey, heated pool next door. Quiet with all facilities required. We found the property without any problems & were very impressed with the accommodation. It was bright, clean & nicely furnished with French doors out into the garden. We didn't use the pool or sauna but they seemed clean & modern. It was very interesting reading the history of Carnethic House which looks very beautiful. We discovered the access to the lane at the back of the house through the gate at the bottom of the garden & enjoyed a very pleasant circular walk - despite the weather. There is also a track down to Readymoney cove just up the road & then on into Fowey which was enjoyable. Just returned from a week's stay in this well equipped and cosy apartment. Many excellent places to eat nearby, walking from the apartment a joy. Best of all a lovely pool to relax in after a long walk. We will definitely be back. Nice flat , with access to pool and sauna. A15-20min walk into the main part of town where the restaurants are. Easy communication with the owner and a good base for exploring.